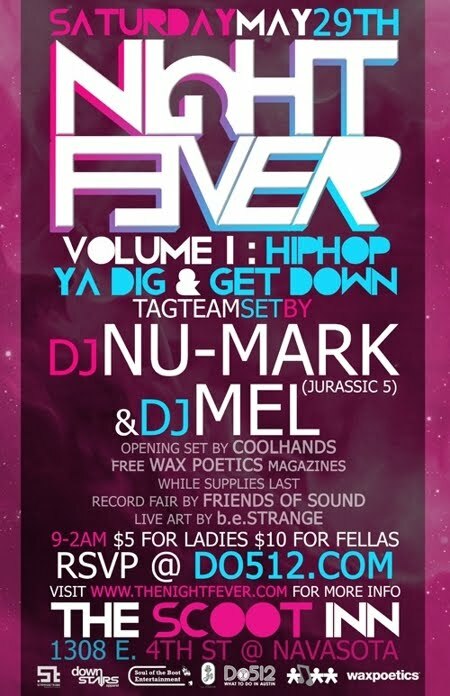 From the LA vs Celtics department... DJ Nu-Mark & DJ Mel @ The Scoot Inn tonight, May 29th for Night Fever! 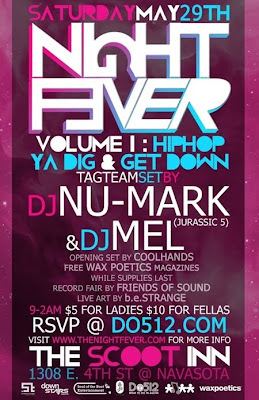 VOL I: Hip Hop! Dude. There's too much this weekend, don't drop the ball. Jurassic 5 was an American alternative hip hop group formed in 1993 by rappers Chali 2na, Akil, Zaakir, Mark 7even, DJ Nu-Mark and Cut Chemist. The group broke up in 2007. Jurassic 5 came together from two separate crews, the Rebels of Rhythm and Unity Committee. The group formed at the Los Angeles, California health store the Good Life Cafe, where they performed at the open mic nights along with Good Life regulars such as Freestyle Fellowship, Abstract Rude, and many others. According to Cut Chemist, "The Good Life was a renaissance period in hip hop." Jurassic 5 released their first record, Jurassic 5 EP, in 1997. The record cemented their position in the 1990s alternative hip hop movement, alongside artists such as Company Flow, Black Star and Kool Keith. The EP was later repackaged with additional tracks and released in December 1998 as the band's full-length debut album, entitled Jurassic 5 LP. The tracks hearkened back to the attitude of New York's Native Tongues Posse, which included De La Soul, the Jungle Brothers and A Tribe Called Quest. The song "Concrete Schoolyard", and the album provided the troupe with a Top 40 single when it reached number 35 in November 1998.